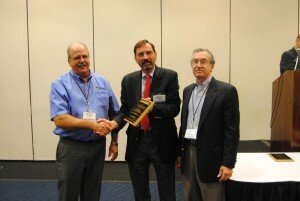 There are a number of different categories in the International Design Competition and the winner in the “Aluminum Die Casting over 10 lb.” was Microcast Technologies, Linden, NJ. 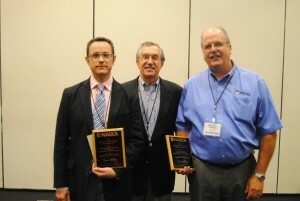 As President of MicroCast Technologies (in addition to being President of Premier Die Casting Company), I had the honor of being present during the Award Presentation by Steve Uvardy, Technical Director of NADCA. Also attending the Awards Presentation was Owen VandeVelde, Product Design Engineer for our customer Acceleroptics (a division of H.E. 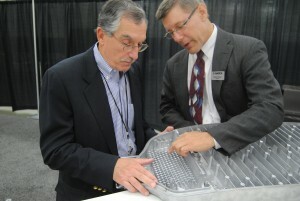 Williams) and Edward Wasowski, Engineering Manager of MicroCast Technologies. Owen and Ed were instrumental in designing a Roadway Housing for an LED Light fixture that runs in an 1100 ton aluminum die casting machine and weighs 15.8 lbs. This award-winning die casting incorporates all of the LED mounting, access and maintenance features in a single die casting, thus lowering the total system cost and providing for long maintenance-free operations of the fixture. MicroCast Technologies, located in Linden, NJ, specializes in aluminum and zinc die casting, machining, assembly and plating services for the military, telecommunications and LED lighting industries. Premier Die Casting Company has been in business 68 years and has a diverse customer base that serves many industries and markets.